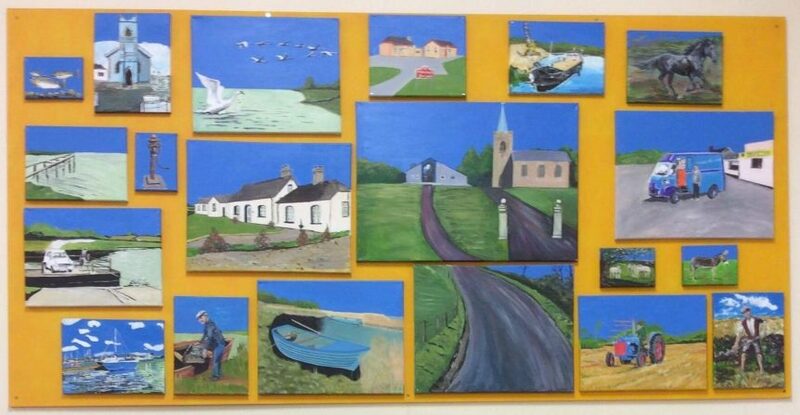 Ardmore Community Association have just unveiled their collection of paintings which were created over recent weeks as part of their Landmarks project. The participants are delighted with their work, which was inspired by David Hockney’s paintings and local habitual scenes from their area on the banks of Lough Neagh. The artwork was developed under the guidance of Artist/Facilitator, Bruce White. When project co-ordinator Carole Kane visited the group, the participants enthusiastically told her about how much painting means to them individually as well as a group. This is clear to see from their collection of artworks which are enjoyed by the wider community in their new centre. This picture shows Artist / facilitator Bruce White and some of the participants on this project.